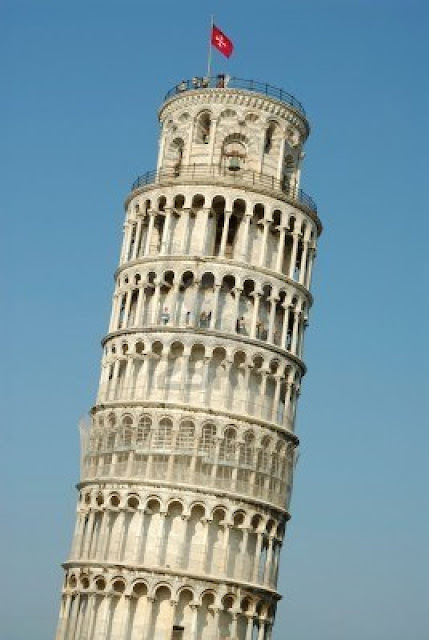 The Leaning Tower of Pisa (Italian: Torre pendente di Pisa) or simply the Tower of Pisa (Torre di Pisa) is the campanile, or freestanding bell tower, of the cathedral of the Italian city of Pisa, known worldwide for its unintended tilt to one side. It is situated behind the Cathedral and is the third oldest structure in Pisa's Cathedral Square (Piazza del Duomo) after the Cathedral and the Baptistry. 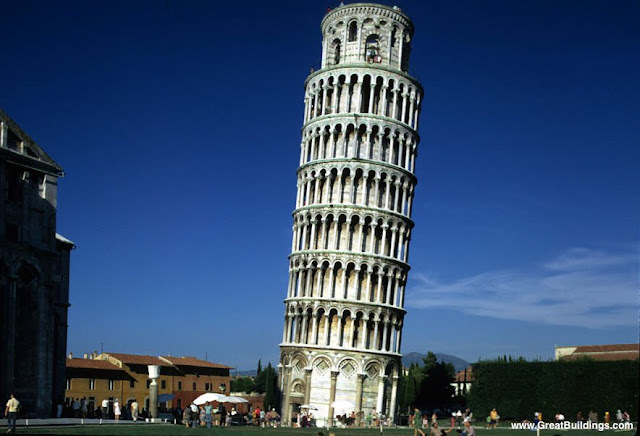 The tower's tilt began during construction, caused by an inadequate foundation on ground too soft on one side to properly support the structure's weight. The tilt increased in the decades before the structure was completed, and gradually increased until the structure was stabilized (and the tilt partially corrected) by efforts in the late 20th and early 21st centuries. Construction of the tower occurred in three stages across 344 years. Work on the ground floor of the white marble campanile began on August 14, 1173, during a period of military success and prosperity. This ground floor is a blind arcade articulated by engaged columns with classical Corinthian capitals. The tower began to sink after construction had progressed to the second floor in 1178. This was due to a mere three-metre foundation, set in weak, unstable subsoil, a design that was flawed from the beginning. Construction was subsequently halted for almost a century, because the Republic of Pisa was almost continually engaged in battles with Genoa, Lucca, and Florence. This allowed time for the underlying soil to settle. Otherwise, the tower would almost certainly have toppled. In 1198 clocks were temporarily installed on the third floor of the unfinished construction.